An Inter-Class Singing Contest was organized by the Music team, from 11th to 14th February. Vocalists were offered the choice to either sing Western (English) or Eastern (Urdu) songs. Selected students from Grades VI to VIII participated and amazed the audience with their singing talent. On Day 1 of the three day event, Mr Suhail Bahadur judged the very first competition held between the sections of Grade VI. 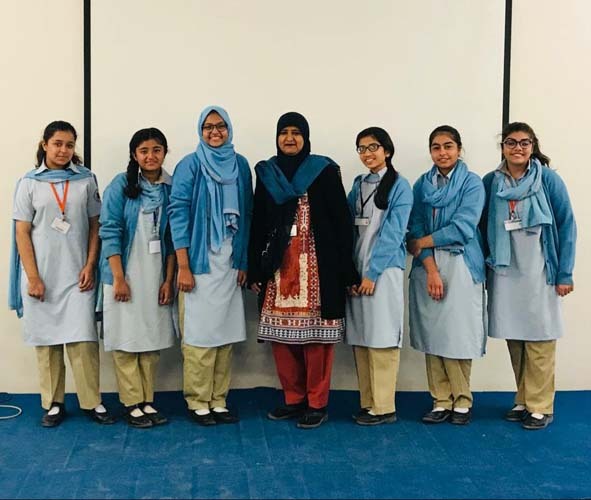 The Singing Contest continued among the sections of Grade VII on 12 February 2019 and selected students participated in either category of Eastern or Western singing. Mr Suhail Bahadur and Ms Kausar Sabeen adjudged the competition. The competitive singing rounds on 13th February invited students of Grade VIII to once again perform in either category. The jury panel on the day comprised of Mr Suhail Bahadur and Ms Uzma Habib. These girls offered the adjudicators a set of tough choices as they competed in tuneful renditions. The talented DPS seniors of O Levels pitched their melodious voices in a closely contested competition on Thursday, 14th February. Ms Sadiqa Afsar and Mr Hasnain Murad adjudged this last leg of the Singing Competition. The Inter Class Singing Contest by the DPS Music Department provided participating students an opportunity to showcase their mastery over voice modulation, pitch, rhythm and tone and enhance their confidence by taking part in the wholesome activity.